Cryptocurrencies seem to make recoveries when all hope lost, and Thursday’s price action of the world’s 2nd largest cryptocurrency, Ether (ETH) and many others is no exception. Several of the Top 10 cryptocurrencies by market capitalization are reporting 24-hour gainers above 10%, including monero (XMR), litecoin (LTC), and EOS. Ether (ETH) is leading the pack while boasting a 17% price increase. And, the total market cap has edged back up over $200-B, after falling lower earlier this week. But, caution, it too early to call any type of long-term Bullish reversal in the market. 1. Ether Recovery Until today, the price of ETH/USD had fallen more than 40% since 5 September and 85% t from its all-time high of 1,400+ set last December. Since the low of 167.32 Wednesday, price has recovered more than 20% reaching a 24-high of 207.67, according to data form the Bitfinex Exchange. A common method of estimating the breakout target of a falling wedge is to add the base range to the breakout point. Since the base range of this wedge is over 900, a long-term measured objective for price would be in the 1100 area if price were to break out near 230. 2. BTC Short-Term Strength The future prospects for cryptocurrencies in general are heavily dependent on bitcoin (BTC) – the world’s largest cryptocurrency by market capitalization. Down 70% from the record high of nearly 20,000 reached in December, BTC could scare the most seasoned investor. 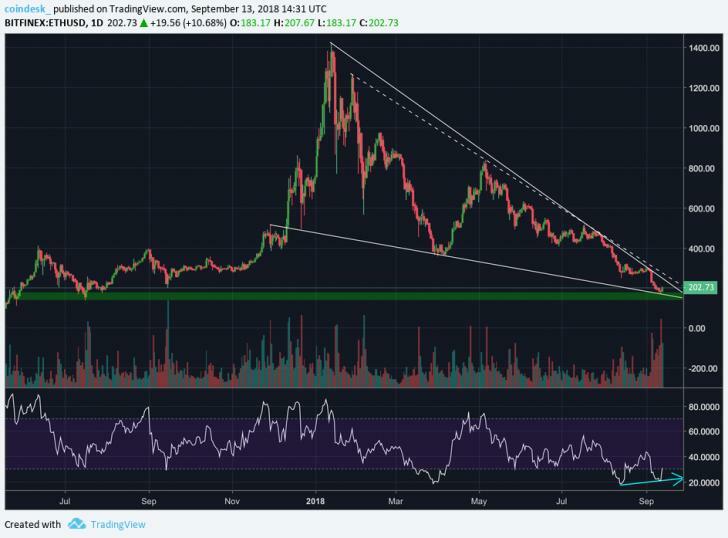 But, a closer look at the long duration technical chart reveals the cryptocurrency is silently charting a major Bullish reversal pattern. 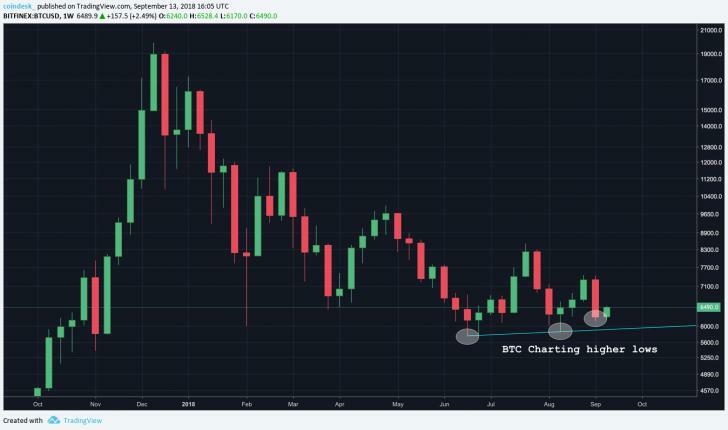 As can be seen, BTC’s recovery from the low of 5,859 in August established the first higher low pattern of the year, the previous low being 5,755 marked in June. Further, the recent sell-off ended at 6,119, meaning another higher low has been created. What Bulls need now is for BTC to set a higher high by moving above the July high of 8,507. That would confirm a long-term Bearish-to-Bullish trend change and could yield a sustained rally above 10,000. 3. Risk Appetite in Global Markets: Risk assets across the globe have picked up a bid in the last 24 hrs on reports that the US and China are heading back to the negotiating table. Clearly, investors are hoping that these talks would yield results, however, trade wars would end only if the US officially drops tariffs. More importantly, the past experience suggests such talks tend to break down in a few days. The renewed hopes of the US-China trade talks could keep the risk assets well bid short-term.